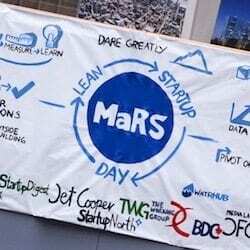 When I teamed up with the good folks at MaRS Commons to co-host Lean Startup Day in Toronto and turn the Lean Startup Conference livestream into a full day of lean activities, I really wasn’t sure what to expect. Would the startup community in Toronto embrace the event? Would a weekday conference bring out the community in strong numbers? Would everyone be able to take something away from the event? I am happy to report that I found out the answers to all of these questions and, on a personal note, gained some insight as to why Toronto was ranked the highest Canadian city (eighthoverall) for startup ecosystems in a recent Startup Genome report. If you want to hear more of the statistics regarding MaRS’ first-ever Lean Startup Day, check out Nathan Monk’s blog post about the event here. I wanted to take a grassroots angle on the day and share four themes that became evident to me throughout #leanstartupday from talking to the entrepreneurs, mentors and investors who attended the event. I found this out first-hand during the day’s workshops by visiting tables and seeing how I could lend some of my entrepreneurial experience to each startup community. Every table I visited was focused on identifying problems, creating solutions and quickly distilling the core of the unique value proposition of their business idea. It was great to be a fly on the wall and to see that, even during the highly time-constrained exercises the participants were given (which were completely voluntary) and among a group of complete strangers, everyone was focused on learning something new from the experience. During the afternoon, those who came and those who remained for the Lean Startup Conference livestream were glued to the three giant video screens, scratching down notes and starting vigorous discussions at their tables during the breaks. Everyone was focused on learning and was hungry for any Timbit of wisdom (pun intended) that they could use for their current or potential startup. Maybe the high interest in startups is due to the fact that many established markets, such as education and environmental services, have reached an inflection point: a crossroads where the emergence of rich technology and a captive audience are revealing large opportunities for disruptive technologies. Maybe it’s because we are in the middle of a global phenomenon with denizens having a stronger willingness to connect and there is a demand for timely information about the topics that affect their lives. Or maybe it’s because movements such as Startup Canada and Startup Weekend Toronto are motivating thousands of people to become part of the startup movement. Whatever it is, the passion, excitement and belief that individuals can change the world for the better have infected Toronto—particularly students and new grads—in a good way. My advice last week to the many budding entrepreneurs who asked me what they should do next was to harness that initial excitement about finding a real problem to solve and to let it propel them across the bumps on the road they will inevitably hit. I reiterated to the many people I spoke with during the day that no startup was built in a day and even the most seasoned entrepreneur needs to continue to learn and adapt in order to succeed. Lean Startup Day attendees were eager to absorb as much information as they could and directly apply that information to their fledgling concepts. More than a few workshop tables asked me if they could have back the lean canvas worksheet that the competition committee collected for judging; they wanted to build what they had started that morning into a lean startup starting right then and there. She was referring to all of the member organizations of the Ontario Network of Excellence and all of the other resources that Ontarians have at their disposal. Just looking around at the MaRS partner booths on Lean Startup Day, you could feel the sense of support there was for the community. I even got a chance to hear about services that are extremely helpful to early-stage companies—such as my own startup—especially those services founders tend to forget about. I’m talking about really useful supports such as accounting and banking, usability testing, and even design and development services for those coming into the community as business co-founders. Getting a chance to work on the inside at MaRS Commons with Jen Marron and Nathan Monk for a few weeks leading up to the big day gave me a new perspective on how MaRS and other government-funded centres of excellence can really help out entrepreneurs. I saw their tireless work efforts and their decision-making first-hand, always putting the attendees’ needs first and making sure the experience centred on making connections, collaborating and learning. There was a constant hustle, including many sleepless nights and long phone calls, to produce an event the scale of Lean Startup Day, and the startup community showed its gratitude by coming out in full force. We have a strong Loonie and are one of the few G7 countries with a positive economic outlook and a swath of top-notch talents across nearly all disciplines. Couple these factors with all of the government, non-profit and general entrepreneurial programs going on and why would you ever consider leaving Toronto? I know others may be quick to poke some holes in my argument, but I challenge you to show me a single reason to leave other than going to a more strategic geographic hub for the industry that you are disrupting. I only started my entrepreneurial quest in Toronto about two years ago, but I have noticed that those entrepreneurs who are most successful around here are those who show up and get involved. They share their experiences passionately and are able to ignite others around them to build what they might have earlier considered impossible. What excites me the most is seeing leaders really start to emerge and contribute to the community in very enriching ways. From longtime entrepreneurs turned startup evangelists to battle-hardened businessmen who want to add value and legacy to their life’s work to venture capitalists turned entrepreneurs, these mentors continue to make their presence felt at major gatherings within the Greater Toronto Area. Experts bring wisdom and wisdom imparts learning, which can only act as an accelerator for founders and mentors who want to see the community share, grow and reinvest in itself. Thank you to these seasoned contributors who are dedicating themselves to emboldening Toronto’s pinpoint on the world’s entrepreneurial map. If you need proof, look no further than the roll call from the two sets of panels that MaRS was able to assemble for Lean Startup Day. Take a few minutes to follow the bread crumbs of these panellists and you will see how active and enthusiastic they are in contributing in any shape or form to events within the startup community. My observations here are by no means scientific or even measured, but I wanted to share my insights from a very collaborative experience and to encourage all those potential entrepreneurs who were in the room to take the leap and continue building Toronto into an even stronger startup ecosystem. I hope that I have shown you four reasons why that is especially true here in Toronto. Is there something that you learned about the Toronto startup community during Lean Startup Day? Share it below with us and let’s keep Toronto’s startup community thriving!